The Appaloosa is one of the most popular horse breeds in the United States, the country in which the breed was formed. It is chiefly a stock horse used in various western riding disciplines, but the Appaloosa tend to do well in many English riding disciplines as well. As a stock horse, it is well adapted to life on a ranch or farm where it gets to work livestock. The Appaloosa horse is famous for its striped hooves, mottled skin, white sclera, and the distinctive coat where a base color is overlaid by striking patterns. When the eye of a typical Appaloosa is kept in a normal position, white sclera is visible around the iris. A wide range of body types are represented within the breed, as a result of multiple horse breeds influencing the Appaloosas throughout their history in the United States. The Appaloosa breed is strongly associated with the Native American Nez Perce (Niimíípu) people and with the states of Washington, Oregon and Idaho, and was named official state horse of Idaho in 1975. Nowadays, the state of Idaho even offers a license plate sporting an Appaloosa horse. European settlers originally called this type of horse “Palouse horse” efter the Palouse River that ran through the land of the Nez Perce people; the Native American tribe that developed the breed. Gradually, a Palouse horse evolved into Apalouse horse, and then into Appaloosa. Many different spellings can be found in old texts, including Apalousey, Appaloosie and Appalucy. In a book published in 1948, a breed called Opelousa is described as a hardy and tough breed of Indian and Spanish horse, used by backwoodsmen of the late 18th century to transport goods to New Orleans for sale. Appaloosas are chiefly used for English riding and Western riding. They are highly suited for many Western disciplines, such as cutting, reining, roping, barrel racing and pole bending. The Camaas Prairies Stump Race is an Appaloosa-only barrel racing contest. For pole bending, there is the Nez Percé Stake Race. Examples of English disciplines were Appaloosas participate are eventing, fox hunting and show jumping. This resilient breed is also a popular choice for endurance competitions and trail riding events. When it comes to horse racing, appaloosas chiefly shine at middle-distances, typically between 350 yards and 0.5 miles. In 1989, an Appaloosa set an all-breed record for 4.5 furlongs (approximately 990 yards), a record that still holds today. Appaloosas are featured in many movies and television series, especially ones depicting life along the American frontier. Two notable examples are El Dorado and True Grit. In the 1966 movie El Dorado, John Wayne rides an appaloosa called Zip Cochise. In the 2010 movie True Grit, the appaloosa ridden by Matt Damon is called Cowboy. Some films have even been named after this horse breed, such as the movie The Appaloosa that premiered in 1966 – a Western film starring Marlon Brando. The Florida State Seminoles, an athletic team representing the Florida State University, have Osceola and Renegade as their official mascot team. Osceola represents the historical Seminole leader Osceola, while Renegade is his Appaloosa horse. The portrayal is supported by leaders of the Seminole Tribe of Florida, even though the Seminoles were not involved in the development of the Appaloosa breed. In the United States, the breed Appaloosa was developed by the Nez Perce people of the Pacific Northwest. 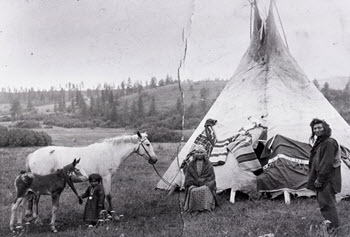 As a result of the Nez Perce War in 1877, the Nez Perce lost most of their horses and the breed fell into decline for several decades. 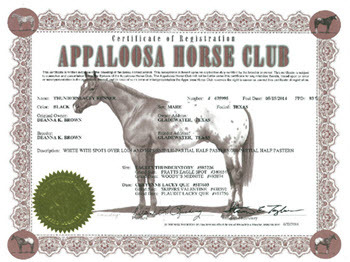 Thanks to a few dedicated breeders, the Appaloosa breed survived, and in 1938, the Appaloosa Horse Club (ApHC) was formed as the breed registry. 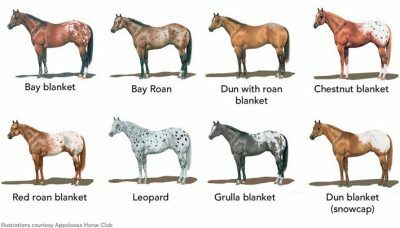 The modern Appaloosa breed can trace its origins back to the foundation bloodstock used back in 1938, but the stud book is partially open and permits the addition of genetic material from certain Arabians, Thoroughbreds and American Quarter horses. 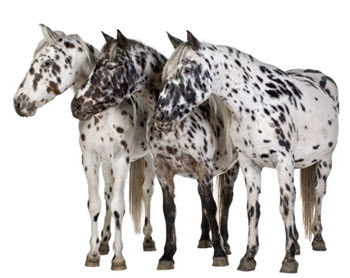 Appaloosa bloodlines have influenced several other horse breeds, such as the Nez Perce Horse, the Colorado Ranger and the Pony of the Americas. 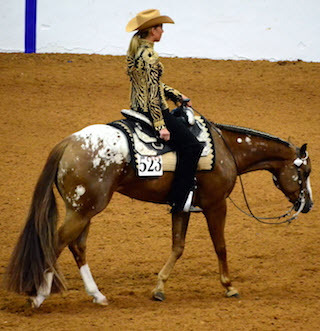 Also, quite a few gaited horse breeds in the United States partly hail from Appaloosa horses. Thanks to binaryoptions.co.uk for their help in keeping this site alive. Binaryoptions.co.uk is a uk based trading guide that provide information relevant to all traders in the English speaking world. The website will help you make money from digital options and CFD:s. It will also help you avoid getting scammed by one of the many fraudulent brokers that try to scam you out of your money. CFD and Binary options trading is safer with binaryoptions.co.uk.